Why we need drilling mud tank? A mud tank is a large storage container used to hold reserves of drilling fluid, because the worked drilling fluids must be stored to the next separation or to the next recycling, or to be reused. In petroleum & natural gas drilling, and directional drilling, the drilling fluids are widely used with functions of providing hydrostatic pressure to down-hole, controlling & maintaining the down hole pressure, keeping the drill bit cool and lubricating bit while it works, and most importantly carrying the drilled-solids to the surface of the well. To maintain the property of the drilling fluids, the drilled solids must be removed by the solid control system which takes the mud tank as the carrier of drilling mud, and also the mud recycling system are used to add additive agents into the fluids, and mix them thoroughly. How to choose right mud tank? The mud tank bears the whole circulation process of the drilling fluids between the wellhead and mud pump. How to select solids control equipments for mud system must base on the whole circulation equipment system, besides, this depends on the capacity you need, and the transportation dimension limit, as well as the layout for mounting the solids control equipments for the mud system. Mud tanks are used by oil drilling companies as storage for drilling byproducts called mud. The mud tanks do need to be cleaned and they require specialized equipment to do so. Many companies have the equipment and expertise to clean mud tanks efficiently and at a cost-effective rate for your business. There are a few ways to approach this task for your business. 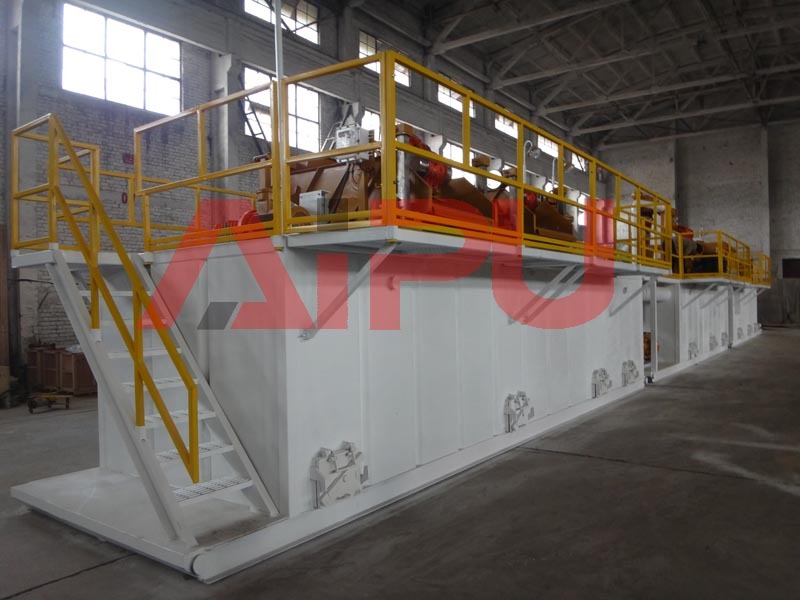 Aipu solids control manufacture mud tank for fluids processing system but also we supply mud tank with customized design. Moreover, we control mud tank production cost well by outsourcing some processing work. So buy Mud tank from us you will enjoy high quality but competitive price. We are professional in manufacturing solids control system, so our mud tanks design are very compatible for mud circulation system using.